…the stations are multicolored anthills bustling with frenetic activity, a brew of smells and noises, a cluster of humanity, dogs and “holy” cows. The train is the market-place, the place where to socialize, to bargain, to discuss, meet people, read, eat and sleep. The cars become homes on wheels, the business-men changes into pajamas from suit and tie and viceversa upon arrival, the women lay out the food for meals; any piece of floor, any corner, bench or square foot of wall can be a good place as any for eating, for a deep sleep or for a brief spell into oblivion. The carriages windows are the screens into a movie made of dry countryside, bald ochre hills, cultivated and dusty fields, straying holy-cows and straying unholy dogs; made of lean women in colored Saris carrying all sort of stuff on their heads, of thin men in white Gandhi hats, Dhoti and Kurtas, riding sturdy and massive black bicycles…while the film keeps reeling into a choreography of small and big temples overlaying a background of pale blue skies…and, eventually, trudging itself like a giant metallic caterpillar, amongst spiffs of black-coal smoke and swirls of tan dust, the train crawls through the Holy City and to the station of Benares. 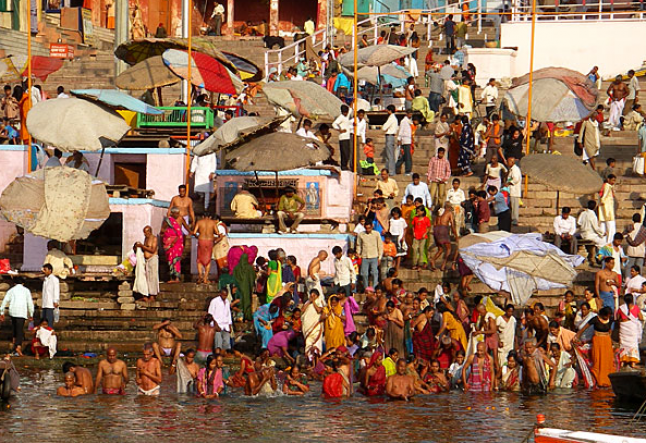 Benares is India, Benares is an epidermal and spiritual experience, is a phantasmagoric blast for all the senses and beyond… it's the Holy Cows dwelling on the streets, is the bearded Sadhus, is the disfigured and ragged “Pariahs” begging along the Ghat. Benares is also the thousands rickshaw hauled by the skinniest of all people, is the oodles of chariots heaped by veggies, fruits, charcoal, stones and cow-dung, is the continuous and buzzing beehive of people filling the streets. It is the magnificent silks, is the countless vivid colors, is the thousands and thousands little shops selling all sort of things. Omnipresent is the flavored Chai, the delicious fresh milk, Curd and Lassi, the strange, pungent and tangy smell of fries, incense, cows, horses, dogs and urine. The cool and narrow alleys between the houses on the banks of the Ganges, is the hundreds temples, Mandir and shrines, is the permeating religiousness practiced everywhere and embedded in the Hindu folks. The perpetual burning pyres spreading the pungent odor of sizzled flesh on the shores of the Holy river, is the corpses wrapped or naked transported on the streets, is the adults and children defecating and peeing without reserve on the alleys, Ghat, by the water. With a multitude of pilgrims performing their daily ablutions and drinking the water of the Sacred River, the swollen and reeking corpses slowly transported by the current and entrapped in the moored boats, carcasses of men, women, kids, pigs, dogs, rabbits, and the thousands hawks, crows, ravens and vultures nibbling on the decaying flesh. Benares is the noisy urchins growing and living on the cracks of the streets, is the ambulant sellers roaming the Ghat and screaming their merchandise, is the barbers cutting hair and shaving beards sitting on the Ghat, on the stairways, on the sidewalks. It is the morphine addicts recklessly tormenting their own blood vessels, is the freaks smoking Chillums upon the hot Ghat’s stones, is the Indians crafting the river’s mud into Murti and smoking pipes. Benares is life and death. Among the 5 senses, smell is the hardest to mentally reproduce… A visit to Benares can be truly remarkable, unforgettable and transformative, it profoundly penetrates the cell memory and perhaps…the sense of the Soul.